Ah, pizza. A standby food in many households, versatile in its toppings, abundant in its availability. There are at least four pizza places I can think of off-hand within 1 mile of our apartment, and I don't even live in a city. In fact, I don't even live in a big town. It's small. Smaller than small. And full of pizza lovers, apparently. Either way, it doesn't matter, because in order to make pizza right, you've got to do it yourself. Now, don't get me wrong, I'm a huge, huge (note the huge) fan of a plain old cheese pizza, dripping in grease. In fact, I intentionally save a slice or two for the morning after, for the even-better cold version of said pie. I live for it, really. Still, part of me (the ironically not-Italian Greek part of me?) knew we could do better. And having just acquired our very own pizza stone (which is now, after one use, broken: sad. We're working on getting a new one aka demanding that Crate & Barrel exchange our obviously defective original stone - save your warranties, people! 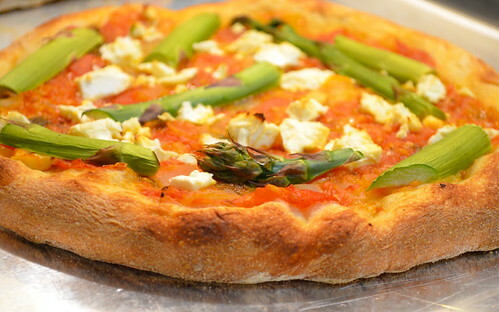 ), we decided, what better way to celebrate those almost-perfect summer tomatoes and NJ asparagus than with a handmade pizza built to highlight both? 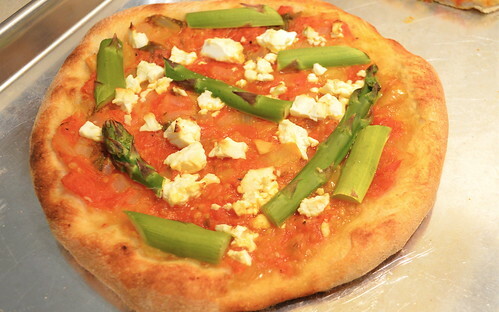 Now the question is, do you need a pizza stone to make your own pizza at home? The short answer is no. You don't need it. Just like you don't need a bagel biter or a citrus juicer. It ups your professional quality, yes, it makes the cream cheese spread evenly and your salad dressing seed free, but do you need it? Nope. For your pizza, a baking sheet will work in a pinch. It won't, however, give you that pizzeria crust which is, let's face it, the whole point of a pizza anyway. You people who leave your crusts behind? I will never poach your leftovers, though I have considered it, and I will also never understand you. Some ready-to-use pizza dough, plus a little flour for rolling/stretching: if you want to make your own dough, go for it. If you don't and your local grocery store isn't any help (though most are carrying it these days), you can usually buy it from an actual pizza place. Tomatoes, and lots of them. 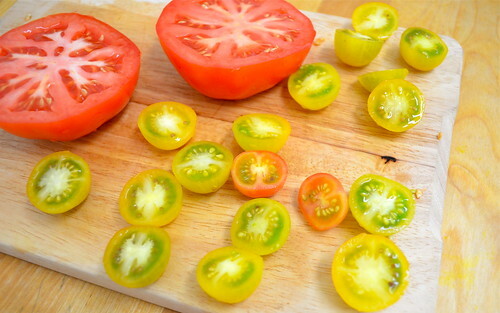 I used about three and a half big guys and about 1/2 cup of baby heirlooms. Heat your olive oil in a small saucepan over medium heat. Add your garlic and onions and simmer until translucent, about five minutes, stirring constantly to avoid burning. 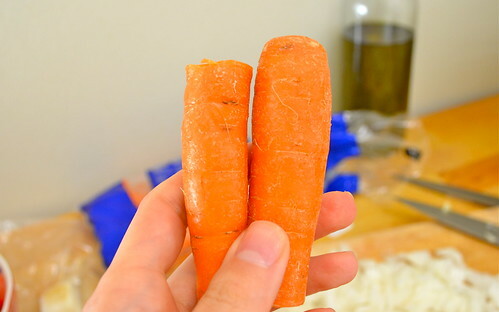 Add your carrot and stir for another minute. 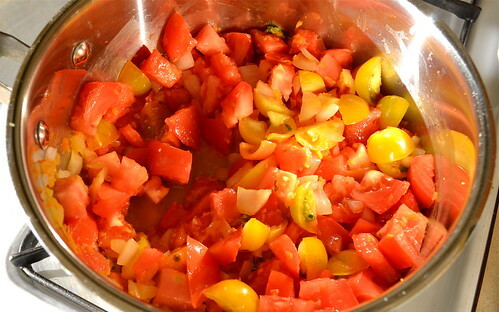 Add your tomatoes (I chopped them, though only roughly; they'll continue to break down as the sauce cooks), salt, pepper and fresh herbs to taste. The trick to this sauce is that the longer it goes, the better it gets. Have some time to kill before dinner? Once this guy gets to a steady boil, reduce the heat to low and let it simmer. For how long? Well, that's up to you. If it really can't wait, it should be useable in about thirty minutes. 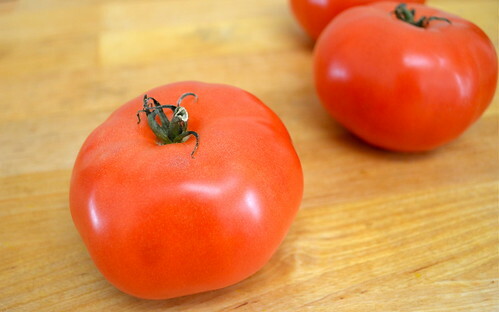 Use a fork or immersion blender to further break down the tomatoes, if desired. As you can see in the picture, we did not desire such things. And now: assembly! 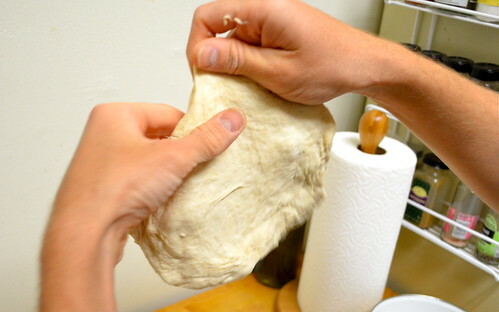 Shape your pizza dough according to instructions. Tip: it's harder than it looks. After a certain point, don't overwork it and just go with whatever shape you have. Not perfectly round? Well, it won't be in your belly, either, so move on. 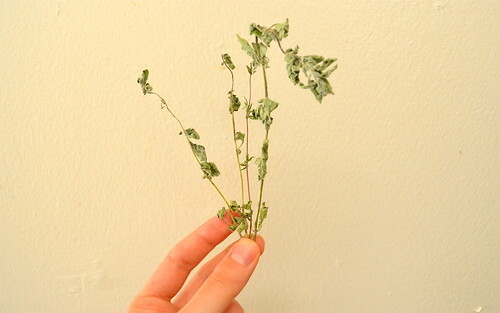 Oh, and the whole tossing thing? For seasoned tossers and pizza veterans only. I tried it once. I had cereal for dinner. From there, the rest is up to you! What we all love about pizza is that there is no wrong answer, right? Top it however you want, any kind of cheese, veggies, or even fruit. 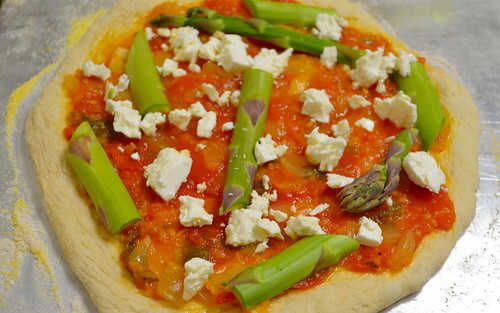 Anything goes, and since that's true, we decided to go with some sliced asparagus and crumbled feta, the perfect salty-tart compliment to the sweet tomato sauce. How long does it have to cook? Beats me, to be perfectly honest. We checked it, often but not too often as to avoid losing valuable oven heat. I'd say about 10 minutes and a professional browning of the crust prompted us to pull the pizza out (much easier to remove, at least if you have two spatulas handy). I don't mean to brag or anything, but this pizza was the BOMB. So much so that it's been verified (by me) that it's totally okay to bring back "the bomb" as an appropriate way of complimenting a freaking amazing occurrence, thing or, in this case, food. I might even go so far as to add diggidty, without even the fleeting thought of apology.